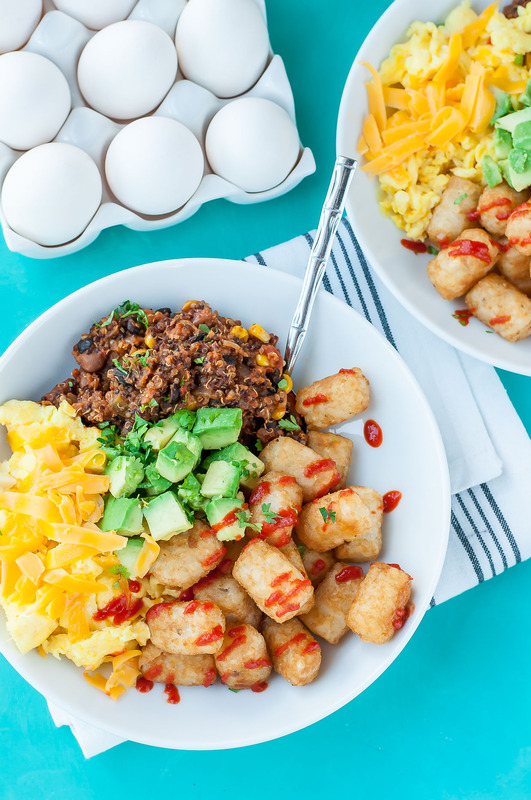 Cheesy scrambled eggs paired with a flavorful vegetarian quinoa chili, fresh avocado, and spicy sriracha tots… These tasty vegetarian tater tot breakfast bowls are ready to rock your face! Breakfast bowls have become a way of life around here and life. is. good. Since eggs are one of the few foods I can almost always count on my toddler eating, we have been partaking in our fair share of breakfast, brunch, and dinner. Delicious, right!? 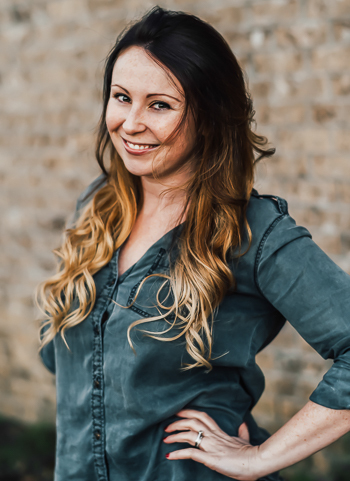 Her obsession with eggs, avocado, black beans, and tots are welcomed with open arms. While I love a good veggie scramble or omelette, they’re not my favorite. I prefer to do the veggie-to-egg-collision myself, with each individual item on it’s own side of the plate, until the exact moment I decide to smash a forkful of veggie goodness into my eggs. The eggs get to maintain their integrity, whether they be fried to crispy/drippy perfection or scrambled for ultimate fluff factor. Naturally, I’m all about the breakfast bowls. Side Note: Does anyone else fight the urge to say “nahhhhhturally” a-la Jenna Maroney with the most obnoxious fake accent ever? Please say yes and your other half of the BFF necklace is in the mail! 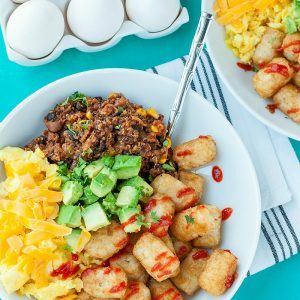 Cheesy scrambled eggs paired with a flavorful vegetarian quinoa chili, fresh avocado, and spicy sriracha tots... 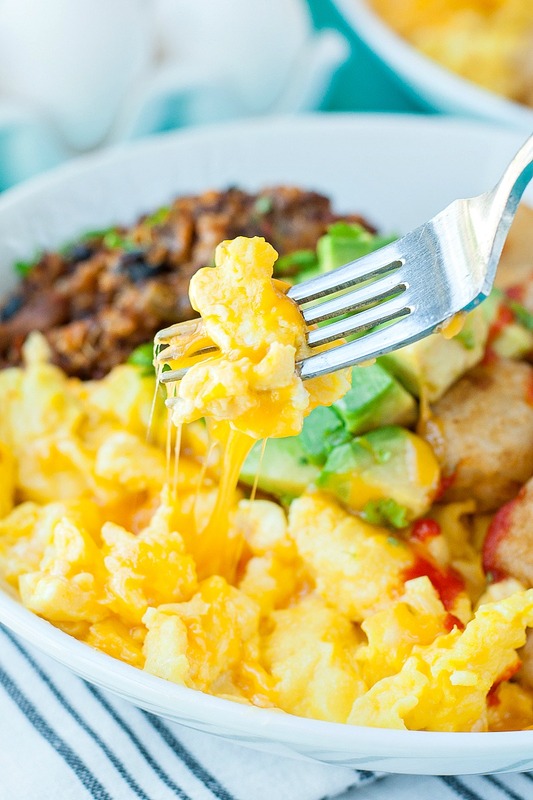 These tasty vegetarian tater tot breakfast bowls are ready to rock your face! Arrange tots on a foil-lined baking sheet in a single layer. Bake for 16-20 minutes or according to package instructions, flipping tots at the halfway mark for best/crispiest results. While the tots cook, reheat your chili, chop/slice your avocado, and scramble your eggs. Ready to eat? Pile everything in a bowl and dig in while it's hot! I hope you love this tasty breakfast bowl as much as we do! I used [this] vegetarian chili recipe but feel free to use any leftover chili you have on hand! I always make a huge pot and save some for leftover re-mixes like this breakfast bowl and my chili stuffed sweet potatoes, then freeze some for a chilly day! If you get a chance to try these tasty tater tot breakfast bowls, let me know! Did I mention this is a restaurant copycat recipes from one of my favorite brunch spots? The inspiration for this bowl-o-deliciousness is The Tijuana breakfast bowl from Daily Eats in Tampa, Florida and it’s legendary. I’m talking love-at-first-bite experience here! The copycat tastes just like the tastebud-rocking original, only my homemade version can be enjoyed curled up in bed with sweatpants so… we know who the true winner is here. I’ll take my coffee in a trophy thank you very much! This recipe is really the most perfect excuse to make a big pot of veggie chili. Have a bowl straight up the first day, make this incredible breakfast bowl the next, then stuff a cup or two in a sweet potato for lunch and call it a day. A really, really, ridiculously delicious day. Kudos if you read that like Zoolander. We’re now officially besties. Did a version of this and love the idea. Like having something like this any meal of the day actually. I did some chili over some left over spaghetti squash with an over easy egg on top. Love the way you write recipes and gave options. It lets the creativity flow. Thank you. Thank you Frances! Ohmygosh the chili spaghetti squash combo with the over easy egg sounds beyond marvelous! YUM! Sounds really good, but I would have to make one change for my adult taste buds; I despise “Tater Tots,” so would cook my own cottage fries and put them in the bowl. But I do understand what it is to feed a little child food they actually like, and am not criticizing the tots for anyone else, please understand. I’d vote the tots for president. Also, I always make a veggie omelet or scrambled all together, but I love the idea of making a bowl of separates to be combined at will. It speaks to my inner OCD chick. Naturallllly. Love this! I love veggie bowls and this one looks real good! ummm I want this as my christmas morning breakfast! Or my every day breakfast. Or dinner. This looks AMAZING! YESSS veggie or not I must have this!